Killing England – The Brutal Struggle for American Independence. 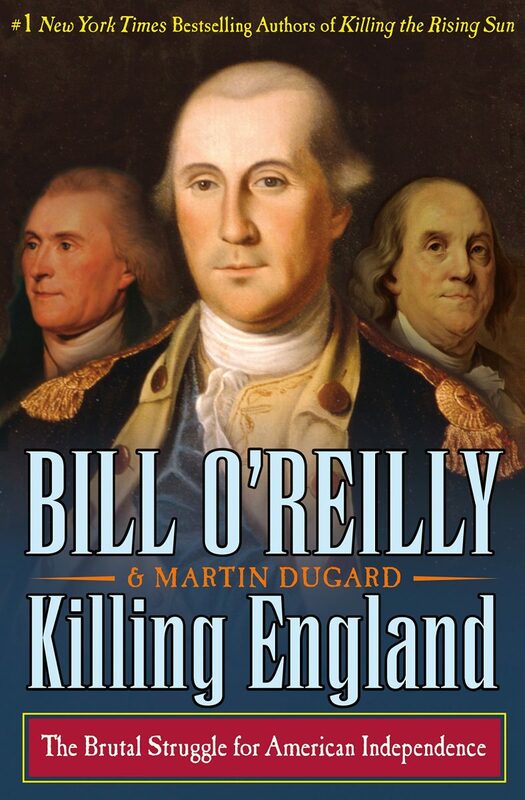 The breathtaking latest installment in Bill O’Reilly and Martin Dugard’s mega-bestselling Killing series transports readers to the most important era in our nation’s history, the Revolutionary War. O’Reilly and Dugard recreate the war’s landmark battles, including Bunker Hill, Long Island, Saratoga, and Yorktown, revealing the savagery of hand-to-hand combat and the often brutal conditions under which these brave American soldiers lived and fought. Also here is the reckless treachery of Benedict Arnold and the daring guerilla tactics of the “Swamp Fox” Frances Marion. A must read, Killing England reminds one and all how the course of history can be changed through the courage and determination of those intent on doing the impossible. I am a history buff and often have to dig through wordy and complex descriptions of times and events written by well meaning historians. Bill and his co-author cut through that jargon and give an entertaining fresh description of the times and the events. You truly get to appreciate the human side of individuals that play critical part in founding of our nation. They bring to life all of their flaws and strengths. You get areal sense of who they were. It is great story telling that everyone can enjoy. The best part – it is our history. Bill O’Reilly has been a broadcaster for 42 years. He has been awarded three Emmy’s and a number of other journalism accolades. He was a national correspondent for CBS News and ABC News as well as a reporter-anchor for WCBS-TV in New York City among other high profile jobs. He holds a history degree from Marist College, a masters degree in Broadcast Journalism from Boston University, and another masters degree from Harvard’s John F. Kennedy School of Government.